Good fish & meat kababs with strong & rustic flavored & taste, some very interesting Biryani that made me rethink my list of ‘best Biryani’ & one of the best Mutton Kormas I have ever had.. Address & other details: Just get into an autorickshaw & ask for Jamil Hotel near Chatori Gali. U will b transported there. In case the auto driver does not know, ask him to take u to Chatori Gali. Once there, just ask for Jamil Hotel situated on a road opposite Chatori Gali. 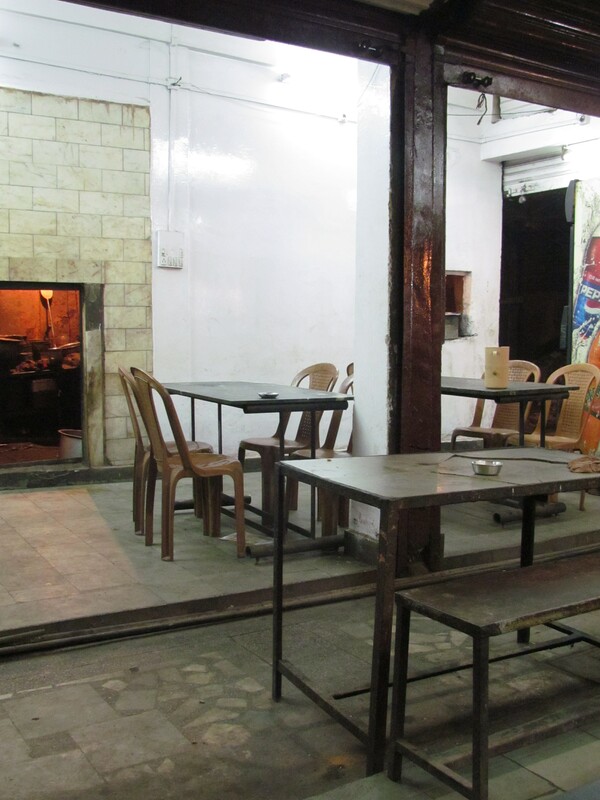 Like Chatori Gali, everything here is very chatpata in taste – rustic, robust. For those of u who rate the look & feel of a restaurant highly, u will b disappointed here. It has quite a shabby appearance, has old metal tables & bench seating. The shop does not even have a signboard. People just know this place. During my chat with the owner, he told us that they will move in to a new bigger building right opposite the existing one & that will b like a regular Restaurant. For those of u who r frightened to eat fried food or food with fat in them, this is not the right place. BUT, if u r one of those who believe in pampering ur tastebuds & then work out harder to burn those extra calories, then this is the place to be. The serving staff at the shop are quite friendly. But as I always say, they do not undergo modern day ‘Hotel Management Training that preaches ‘Customer is the King’ etc. So they behave with u in a person to person basis & treat u as another person they r dealing with & not a ‘Customer’. So if u r friendly, that is reciprocated & vice versa. We were lucky to have the Chef come up to the table post the serving staff ran out of answers to my questions. The Chef was really nice & explained things. When we ordered an extra Biryani to end the meal, he gave a complimentary ‘gravy of Mutton Do Pyaza’ to taste. As u enter the shop, u r greeted with the sight of Marinated meats & fishes. These are cooked on request right in front of u. So there is almost nothing that is made & stored. So we had some good kababs, some outstanding Korma & a very very interesting Biryani. 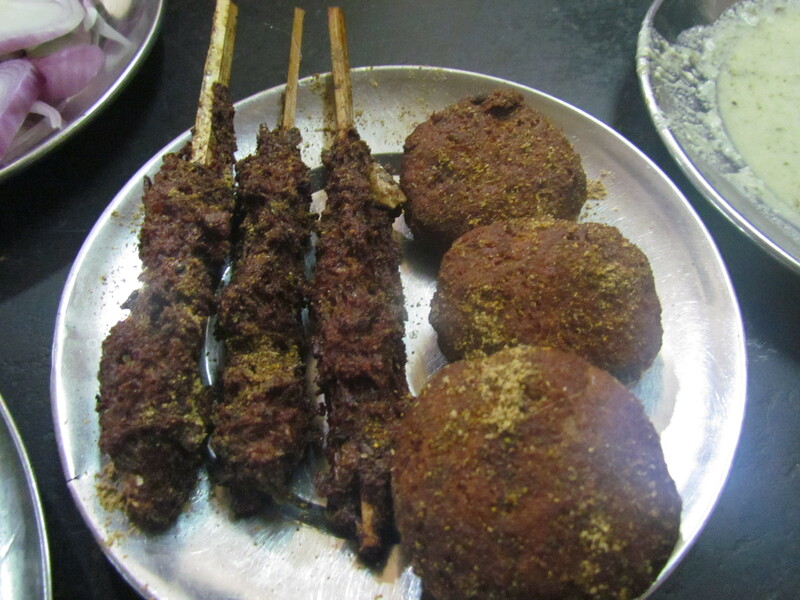 For starters we ordered Chicken Shammi Kabab & mutton sheekh. The Shammi has a fairly thick & crispy outer layer & soft chicken filling inside. The filling had much more chicken & less Daal – so it was softer inside. The flavors were subtle unlike most of the food in this place. A chatpata masala was sprinkled on the top whih u cud dust off before eating if u like it relatively more subtle. 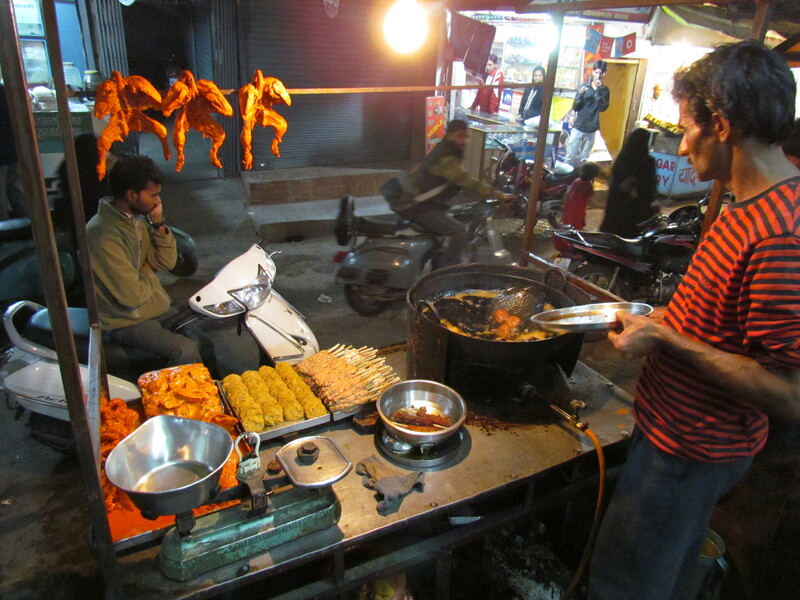 The Sheekh kabab was very different from all the Delhi & Lucknowi varients that I have had so far. 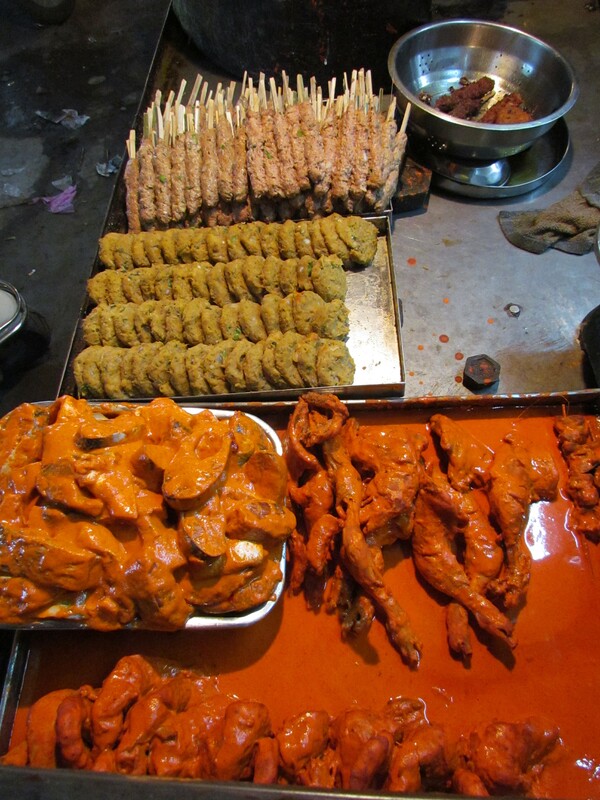 Unlike the ones mentioned above, the kababs at Jamil Hotel r not soft & melt in the mouth. Rather, they are crispy on the outside & inside they are enjoyably soft & textured – The mutton mince grains are large & uneven. That gives it a very unique taste & texture. Reason for the crispiness is that instead of being roasted, these kababs r deep fried!!! While I still like my Lucknowi varients more, I wud surely eat this Bhopal version again. Post this came the Biryani along with Burhani. As u might have figured out by now, I have my strong prejudices about Biryanis – Once again I drool over Lucknowi & Kolkata Biryani. They both r known for their super soft melt in the mouth aromatic long grain rice & also the fact that the meats & rice are cooked together. The Jamil Hotel version was very different though. It had long strands of rice than normal rice but they were not traditional Biryani rice. The use of deep fried browned onion slices for garnishing was very interesting & added a twist. The rice was not aromatic but soft – not as soft & melt in the mouth as the Lucknowi variety. 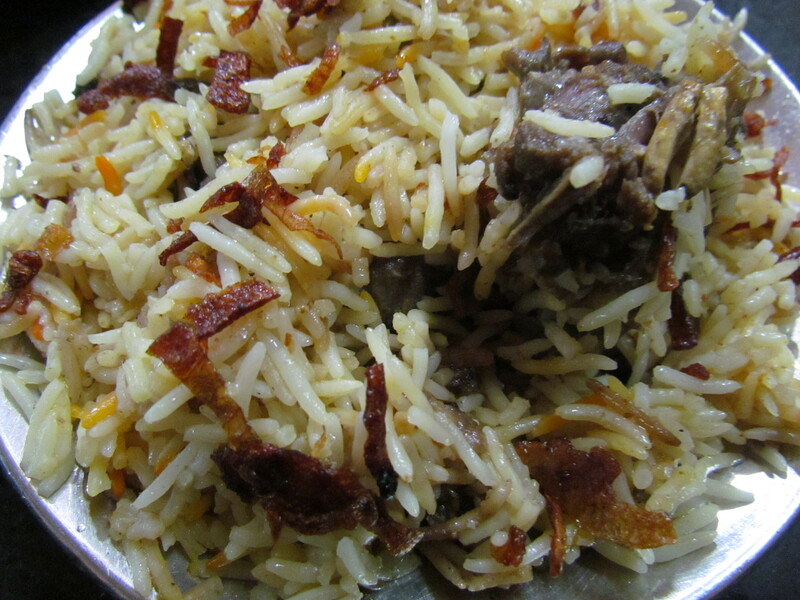 What however is a killer is the mutton pieces in the Biryani – They r softer & tastier than the best Mutton Biryani that I have had so far – Arsalan Kolkata & Tunday’s Lucknow. This Biryani scores High on account of this immensely good mouthwatering mutton pieces. The wow korma was served with Tandoori roti. It was a thick, flavorful, moderately hot gravy that had a hint (just a hint) of sweet. The masalas had completely intermingled within themselves & with the mutton pieces to give an intense taste. The mutton pieces were unbelievably soft & tasty – The best Korma I have ever had so far. Karim’s Delhi & Arsalan Kolkata is a far cry from this. After eating all this we reordered a Biryani. 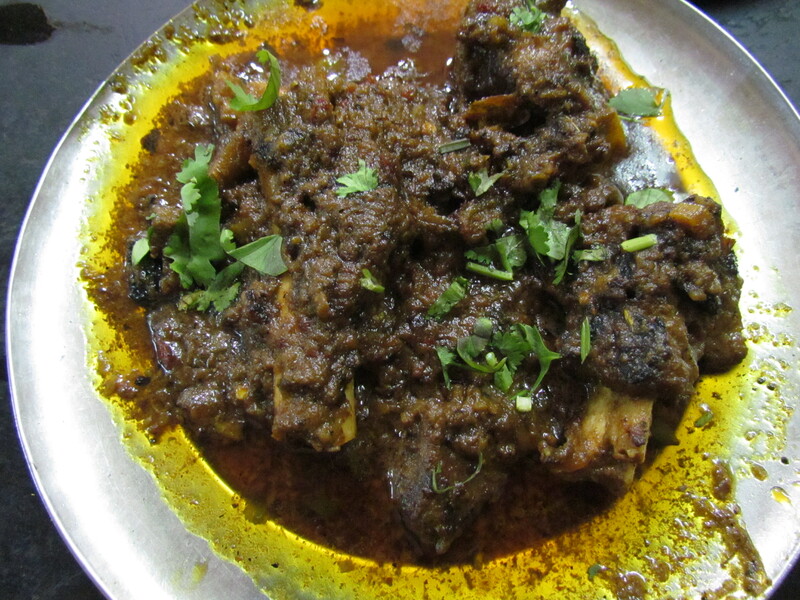 It is then that the Chef gave a plate of mutton do pyaza gravy – That was too good too. As compared to the Korma, it was more subtle & flavorful. I however liked the intense taste of the korma better. They make good halwas too which I guess u should try for dessert. I am surely going to visit them in my next trip to Bhopal. what details r u looking for, Gulshan.